Ti enables Ineternet of Things (popularly known as IOT). Here is a white paper on the Evolution of Internet of Things from TI. Monetizing M2M (Machine to Machine) aka IOT. IOT is moving from Industry to Consumers – Sooner than you think. Devices connected to the internet — everything from coffee makers to toys — are going to become awidespread consumer phenomenon sooner than you expect, even though Europeans and Americans for now regard the technology in different ways. Until now, smart machines connected to the internet have largely been the province of industry and governments. In the view of two executives, however, such devices will soon become ubiquitous at a consumer level, and everything from coffee machines to toys will have at least a brief life on the internet. What is this Internet of Things? What jobs will it create? What jobs will it destroy? What is the impact on your life or career? Is it good or bad? Do we lose more control as human beings and become hopelessly dependent? These are a few of the fascinating questions. I know you probably have even more. It will be exciting to watch the developments, adoption rate and the accelerating change this technology and applications will bring into our lives. A computational process is indeed much like a sorcerer’s idea of a spirit. It cannot be seen or touched. It is not composed of matter at all. However, it is very real. It can perform intellectual work. It can answer questions. It can affect the world by disbursing money at a bank or by controlling a robot arm in a factory. The programs we use to conjure processes are like a sorcerer’s spells. They are carefully composed from symbolic expressions in arcane and esotericprogramming languages that prescribe the tasks we want our processes to perform. I watched the original lectures (from MIT) a while ago and it was an amazing experience. Here is a Python version of this book. The top 10 cloud-adjacent requests reveal an Open Source trend, with key requests included everything from Linux to configuration management systems like Chef and Puppet to programming languages like Python, Perl and Ruby. 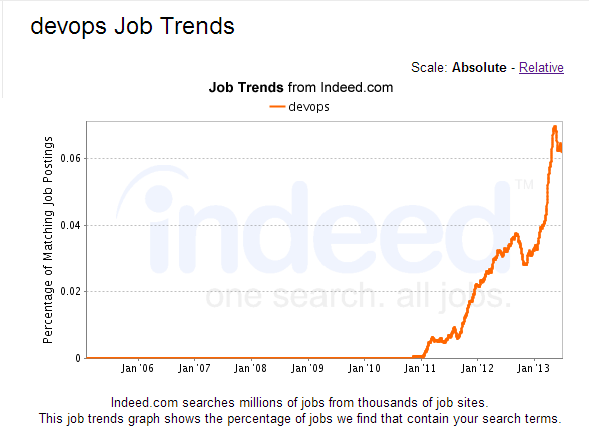 the “superstar coupling” of development and operations now has nearly 500 jobs posted on any given day. Indeed confirms this trend. In fact there are over 1000 jobs paying more than US $90,000 from this job search as of Sep 14 (these figures may change if you are looking at it on a different date). Startup Idea Pitches – Can we Make Them Better? In the past few weeks, I listened to over 50 pitches in 5 different events. Most of the pitches have too much information in them. What is your solution? How is your solution different from other existing solutions? How big is the market and what niche do you plan to target? When left to themselves, presenters want to throw in the kitchen sink into their presentations – lots of text, pictures, diagrams and even videos. They have so much to say and they want to say it all. I don’t blame them. I used to be exactly the same. The eagerness to share all my research and finding with the audience and educate them is very compelling. It is difficult to teach people to listen to questions carefully and give relevant answers. They seem eager and read too much into questions. Keep your answers short and relevant. Questions show gaps in your presentation. So note down (or record) the questions and think about them and refine your presentation. It is difficult to talk less. Practice helps. Posted on September 12, 2013 March 8, 2019 Categories Startups and Entrepreneurship4 Comments on Startup Idea Pitches – Can we Make Them Better? Disfluency – Leads You To Think More Deeply? The basic idea here is that when you have a thought, any thought, it falls along a continuum from fluent to disfluent. A fluent thought is one that feels subjectively easy to have. When you speak English and you come across a common English name, like John, or Tom, or Ted, it’s very, very easy to process that name. There’s no difficulty in reading the name and in making sense of the name. At the other end of the spectrum you might come across a foreign name or a novel name that you’ve never seen before or perhaps a name that you’ve seen before, but spelled very differently. In that case it’s going to be much more difficult to process the name. Then it will be disfluent or subjectively difficult to process. It will feel more difficult to process. Adam walks through different examples about the impact of fluency on our thinking and even decision making. The concept of cognitive blocks and their effect on your thinking is worth exploring. It impacts learning, teaching and working. I particularly liked the notion that persevering through difficulty helps you to deal with different types of difficult problems and your ability to reason through different tasks. Posted on September 9, 2013 Categories Cognition and Meta Cognition2 Comments on Disfluency – Leads You To Think More Deeply? From “Head First” series of books. I love the Intro section where they talk about using an informal style, touching emotions and other ways to engage learners. We can use some of these ideas to engage students in face to face interactions in class as well. Instead of delivering long lectures that put them in a listening (or sleeping) mode, it may be good to provoke them into thinking and kindle their curiosity to learn more. Education and Innovation – Is There a Correlation? This is the first hint of how Finland does it: rather than “trying to reverse engineer a high-performance teaching culture through dazzlingly complex performance evaluations and value-added data analysis,” as Americans do, they ensure high-quality teaching from the beginning, allowing only top students to enroll in teacher-training programs, which are themselves far more demanding than such programs in America. A virtuous cycle is thus initiated: better-prepared, better-trained teachers can be given more autonomy, leading to more satisfied teachers who are also more likely to stay on. One thing is very clear (even from my own schooling experience). Great teachers make a big difference. In fact most of the subjects I developed liking for in school were because of great teacher. Reading this review, however makes me wonder about the correlation between education and innovation. If American schools are so bad, how come there is so much innovation in America? From this latest Global Innovation Index 2013, US ranks 5, Finland 6, South Korea 18 and Poland, a distant 49. You may want to glance at How Your School Compares Internationally an OECD report. There is a lot to think about and connect the dots. We also need to gather a lot more data on school performance, innovation at a young age, percentage of high performing students in research. Some correlations with entrepreneurship would help too. Changed the name of the post and the link as well. My visits to Quora are pretty infrequent and random. But something got me there this morning and when I go, I try to answer at least a couple of questions (and they get tweeted). Today’s focus was on finding out who is hiring Python programmers in India. You can look through the answers but I have a feeling that we have not even scratched the surface. Need to keep digging.